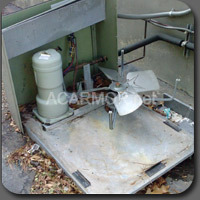 Call us for Details 1-877-90-ARMOR (27667)! How do I know what size AC Armor I need? Does AC Armor come in colors other than black? Is AC Armor theft proof? How do I bolt AC Armor to the concrete? How do I install AC Armor in the ground? I have seen recently where I can purchase tamper-proof screws for my AC unit panels. Do these work? What if I don't have much of an air conditioner pad at all? What do I do if I have a plastic air conditioner pad? Simply measure the dimensions of your air conditioning unit; width, depth, and height. You will also need to measure the air conditioner pad; width and depth. The air conditioner pad is the pad that the air conditioning unit sits on. Lastly, you need to determine what the AC pad is made of; concrete or plastic. This information will help you determine the size and installation process best for you. Yes, AC Armor can be manufactured in custom colors. Please contact us for details. No, AC Armor is not theft proof; however, AC Armor is an excellent theft deterrent. Statistics have proven that thieves prey on easy targets such as homes and businesses with no alarm, barking dog, poor lighting and visibility, etc…. With AC Armor you will no longer be an easy target. Your AC Armor will be shipped complete with tamper-resistant anchor bolts to secure your unit into the concrete. Your AC Armor can be shipped either assembled or dis-assembled for ground delivery . Once assembled place your armor over your air conditioner and air conditioner pad. Mark the spots where the posts contact the ground. These spots serve as a template for where you will install your AC Armor. In the marked locations, dig four 12" deep holes approximately 12" round. Fill the holes with Quickcrete concrete mix. Place your armor over your air conditioner and pad so that the legs are set in the Quickcrete. Using a level tool, make sure your armor is level and allow to dry. Tamper-proof screws may be helpful in deterring a thief from access into the panels of your ac unit while the unit is still on your property; however, it will not stop the thief from stealing the entire unit. 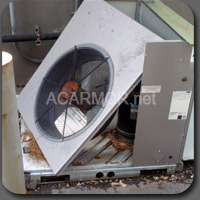 AC ARMOR will deter theft of the entire unit. Your air conditioner should not sit directly on the ground. You can either purchase a plastic pad or have a concrete pad installed. If your air conditioner pad is plastic, you should install your AC Armor into the ground around both your air conditioner unit and pad according to directions. Copyright © 2010, AC ARMOR LLC. All rights reserved.